Are you longing for a distant era when men were knights and damsels in distress could rely on being rescued by a dashing hero? 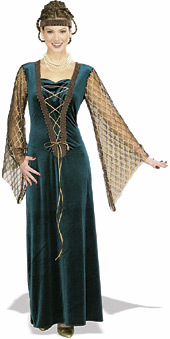 This Lady Guenavere adult womens costume can transport you to the medieval times with it's plush green velvet and lace up bodice. The Knights of the Round Table will trip over themselves trying to win the heart of this lady in waiting. Slip on the Lady Guenavere costume and let them carry you away.